Silverwood bakeware is made from an anodised aluminium alloy which is an extremely efficient heat conductor resulting in even heat distribution during baking and reduced cooking times. The molecular surface of the metal is permanently changed to create a surface that can never blister or peel even under the most adverse conditions. 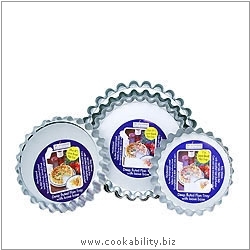 More information on Silverwood Bakeware here. Varies between 1" and 1½" depth. Extra depth enables more filling to be used. Ideal for vegetarian style dishes. The excellent conductivity helps ensure crisp pastry. Loose base for speedy removal and minimum damage. Best possible material for baking. Aluminium core is 'sealed in'. Easy release and easy clean.